In a part of the world where herbal wellness formulations are a normal part of an educated life and Network Marketing is not only understood but ingrained in the economic climate of every progressive nation, it has been a paragon of excellence since 1995. Today, Gano Excel is already a global wellness colossus. As part of its global expansion plan to be in 100 countries in 10 years, Gano Excel is already present in more than 40 countries throughout Europe, the Middle East, Asia, Australia and North America. It has done so with a kind of compelling integrity that quickly becomes the stuff of industry legend. Right now the numbers add up for what is certain to be the "next big thing" in the health and wellness industry. A successful track record, a very solid debt-free financial substructure, management that offers the perfect synergy of business acumen and product expertise, a product line that is both original and professionally respected, and a dynamic growth curve that spells WINNER in capital letters in all markets where it now exists - Gano Excel has, according to most industry experts, assembled all the right ingredients to become the next global direct sales juggernaut. Gano Excel - The Back Story.This journey of more than two decades has been one of commitment, dedication, tireless research and compromised integrity. And the results have been measured in geometric progressions both for Gano Excel and for professional recognition of its remarkable product line. Gano Excel, an innovative nutraceutical firm based in Malaysia, is taking the coffee industry by storm. Using coffee to deliver the health benefits of Ganoderma Lucidum, Gano Excel has created a whole new market category: health-promoting coffee! Ganoderma Lucidum is thought by many to be the most revered herb in Chinese medicine and has been since it was first used over 4,000 years ago by apothecaries in the Yan Dynasty where it was crowned the "King of Herbs." Thought of as an herb, Ganoderma is technically a fungus - or what are popularly referred to as a therapeutic mushroom whose beneficial effects have been so highly regarded that it helped trigger an entire field of scientific research nearly 100 years ago, called mycology (the scientific study of mushrooms). In Nature's pharmacy where all true healing originates, there are a few super stars. Among the thousands of different mushrooms that exist, only a handful qualify as completely beneficial - the Maitake, the Shiitake, the Cordyceps and the Ganoderma Lucidum. Among them, only the Ganoderma Lucidum offers a unique blend of more than 200 beneficial nutrients, including an entire complement of vitamins, trace minerals, enzymes, immunomodulators, adaptogens, anti-allergens, polysaccharides and organic germanium. What that suggests to us is a therapeutic potential that is without equal in the world of natural foods, herbal remedies and traditional over-the-counter drugs. With the proprietary cultivation methods developed by Gano Excel, Ganoderma Lucidum is now available for mass consumption. From Nature to the World Market. The challenge with the Reishi mushroom has always been the matter of its perishability. And one of the most profound influences Gano Excel has exerted over the globalization and international marketing of Ganoderma Lucidum has been its perfection of the planting, growing and harvesting of the delicate Reishi mushroom. To assure that this is properly accomplished, Gano Excel emphasizes bringing all its product formulations through one of the most scrupulous manufacturing processes available anywhere. 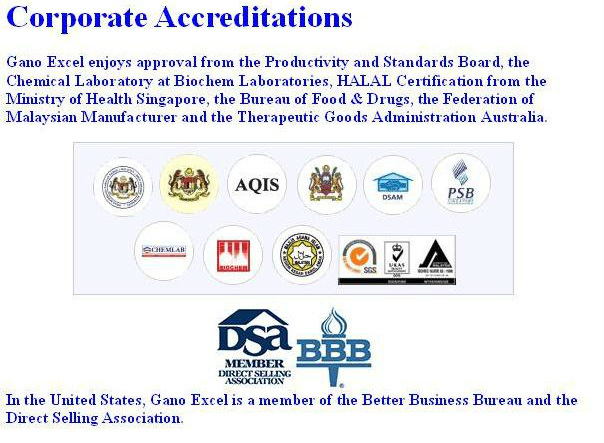 All Gano Excel operations receive the GMP (Good Manufacturing Practice) certification. In this process, no detail is missed, and no issue is unresolved. From product development to customer relations, Gano Excel's management has dedicated itself to one philosophy: the pursuit of excellence no matter the cost. It's a part of their mission statement and more than a major component in their game plan to be one of the largest and most influential wellness products companies in the world. Gano Excel - A New Kind of Marketing Concept. The Gano Excel Mission Statement is simple but loaded with intention: "To bring health and prosperity to every family!" It is a message taken very seriously. Beginning with its very original product formulations, continuing with its superb state-of-the-art processing and manufacturing techniques, Gano Excel has found what they are convinced is one of the international network market's most effective success-builder programs for income generation, duplication and financial independence - one that is set in place to empower everyone who aligns their business goals with Gano Excel's to enjoy the most dynamic income opportunity anywhere, and to achieve their dreams: all of them! It's a challenge that is met with a great sense of responsibility and an awareness that not all companies that set out to accomplish these objectives in the field of wellness succeed. The Gano Global Network Gano Excel has a very reasonable goal for international growth and expansion that includes growing to 100 nations in 10 years! And thus far, they seem well on track to accomplish just that. Currently Gano Excel has an international presence in more than 40 countries, including Malaysia, the Philippines, Singapore, Pakistan, Taiwan, Thailand, India, Australia, Canada, the United States of America, Indonesia, Hong Kong, Brunei, Nepal, Bangladesh, Romania and Uzbekistan to name a few. Part of the reason Gano Excel has been able to grow with such intelligent force has been its sophisticated skills in networking their business, one that combines the best of both worlds of personal contact and the proliferating power of e-commerce. If Gano Excel surpasses all other companies, it is in its ability to put all its network affiliates first with superior service, training and hands-on success mentoring, training and networking success seminars. Its immediate advantage comes in having one of the best, and most highly consumable wellness product lines in the health industry today. And it follows through with some of the most imaginative and informative success coaching in the world. It is a system of duplication and income generation that it is enhanced geometrically by its understanding of the global marketplace and how to farm it through e-commerce technology. Further reason why it has already grown to $500 million in annual retail sales! Gano Excel North America - The Saga of Healthy Coffee. It is something of a tradition in Gano Excel's philosophy of international expansion that each division has the opportunity not only to bring new energy into the company dynamic, but also to introduce new product concepts to the Gano Excel family of fine products. In the case of Gano Excel North America, its management has already shown a keen sense of the new network marketplace and what products would best work for it. Although achieving a great deal of success and market share by selling its traditional line of Ganoderma-based natural products, the Gano Excel North America management team believed they had to go deeper into the core needs of the U.S. and Canadian public. To do so, they found a way to easily introduce the health benefits of Ganoderma Lucidum using a beverage that almost everyone drinks every day. And what better carrying medium than the second most popular drink in the world? Coffee! Coffee is the second most popular beverage in the world behind only water. Not only that, but coffee is considered the world’s favorite comfort food. Besides, it’s very easy to ask someone if they would like a cup of coffee. What a great way to not only open the North American market (the largest consumer of coffee) but the world market as well!" All Gano Excel products are based on what may prove to be the best and "healthiest ingredient" of all – the Ganoderma Lucidum mushroom. If you'd like to learn more about Gano Excel North America, its wide variety of beverage, personal care and supplements, as well as its remarkable income opportunity, click here. Working with Gano-Excel headquarters R&D North America's executive marketing branch came up with the world's first molecularly adjusted "nutritious coffee" - with reduced acid, a better balance of caffeine, all the 200 nutrients that Ganoderma Lucidum is world renowned for. Meanwhile, enjoy these interesting facts about this exceptional company. Has over 700 million satisfied consumers worldwide in over 100 countries...and growing! Has global retail sales now approaching over a billion dollars. Is the world's largest grower and producer of organic Ganoderma Lucidum. Operations are completely vertically-integrated - from plantation to manufacturing. Is the “The World’s First Choice” with its unique blend of delicious coffee and Ganoderma Lucidum. Ganoderma Lucidum on Good morning Arizona! Or watch us live below! 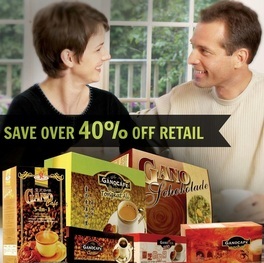 Love Gano Excel Products? Enroll for for Whole-Sale Price! Also Earn Rewards Points available only on Auto-Ship! For your convenience, Gano Excel will automatically send your items on the (day you chose) of the month through our Auto-Ship program. There is no obligation and you can cancel or add and remove items from your Auto-Ship at any time by calling our customer service department or Online through your Back Office.